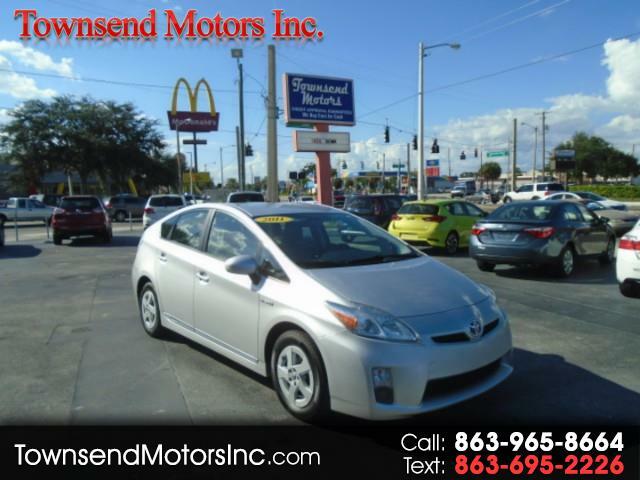 This nearly new 2011 Toyota Prius offers no surprises over prior year models, just significant improvement. It's sleeker and better looking, and more powerful while delivering an EPA-rated 51/48 mpg City/Highway, up by 3 miles per gallon. The 1.8-liter gas engine is also new, producing more horsepower while being more efficient. Top speed has flown to 112 miles per hour from 103 mph, slam-dunk evidence that the Prius is a lot slicker package at half that speed. Standard magic includes Touch Tracer Display, projecting info before your eyes, so you can keep them on the road. Input comes from the pilot at the controls on the steering wheel, including not just audio and cruise control, but also climate control and trip computer, with telephone and other controls available. Our Prius is evolutionary, with substantial improvements in styling and the hybrid powertrain. It's sleeker and better looking, and achieves a combined 50 miles per gallon. Print this page and call us Now... We Know You Will Enjoy Your Test Drive Towards Ownership! Visit Townsend Motors Inc online at www.townsendmotorsinc.com to see more pictures of this vehicle or call us at (863)236-0917 today to schedule your test drive. Message: Thought you might be interested in this 2011 Toyota Prius.